Solana Beach voters will weigh in on the development of a proposed senior care facility in a mail-in ballot special election May 7, paid for by the facility developer. The ballot will ask whether voters are in favor of amending the city’s General Plan with a Specific Plan allowing for a senior facility on the property in question. The Solana Beach City Council approved the special election during an open meeting last week. Developers are proposing an up to 99-bed assisted living and memory care center, just south of the Timbers building, on a vacant lot on Genevieve Street, adjacent to and east of I-5. The process requires that if the facility is to go forward, voters must approve a Specific Plan for the facility, due to Proposition T.
If the electorate votes in favor of the facility, the project still requires approval by the Solana Beach City Council and the California Coastal Commission. Permitting and construction would begin following all approvals, and take approximately 18 to 24 months. The senior care center would occupy one of the last pieces of available land in Solana Beach — which is ideally suited for a senior facility. Developers have met extensively with Solana Beach residents over the past several years to address neighbors’ concerns and produce a facility that meets the city’s needs and enhances the neighborhood east of I-5. A draft Environmental Impact Report has been prepared for the project, and will be published soon. For more information on the Solana Beach Senior Care Facility and to be kept up to date on future events concerning the project, sign up for updates at https://www.solanabeachseniorcare.com or SolanaBeachSeniorCare on Facebook. Have you seen people gathering signatures for put a new senior care facility in Solana Beach on the ballot? They are outside Vons, Sprouts, and the post office until mid-January. Here’s why we need a senior care facility in Solana Beach. Solana Beach’s population is aging. 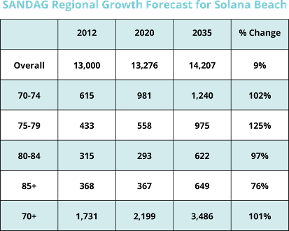 There will be approximately a 100% increase in Solana Beach residents over the age of 70 between now and 2035. We need a place nearby for ourselves, and for our parents. Studies have shown that seniors living in a community, rather than home alone or with caregivers, are typically healthier and live longer.